Our strategies provide long term results providing you with an amazing ROI. 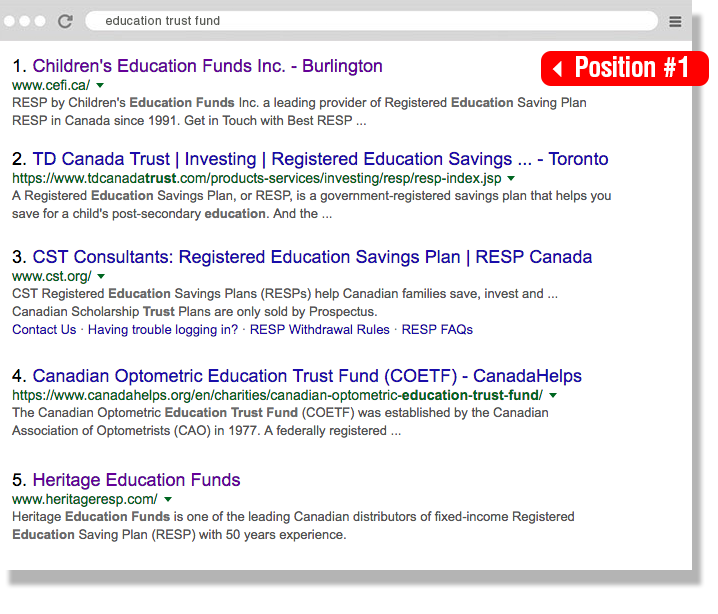 Children's Education Funds Inc. is a great company that sells Registered Education Savings Plans. This puts them in direct competition with large banks which are of course rank high in Google because they are seen as a high authority in any product they sell. This makes it extremely challenging for anyone else to achieve one of the coveted 10 positions on the first page of Google. With great effort and persistence they now show up on the first page of Google for over 50 keywords/phrases! More than 10 of those are 1st position. For some companies the math is simple - the more traffic to your website, the more business you get. 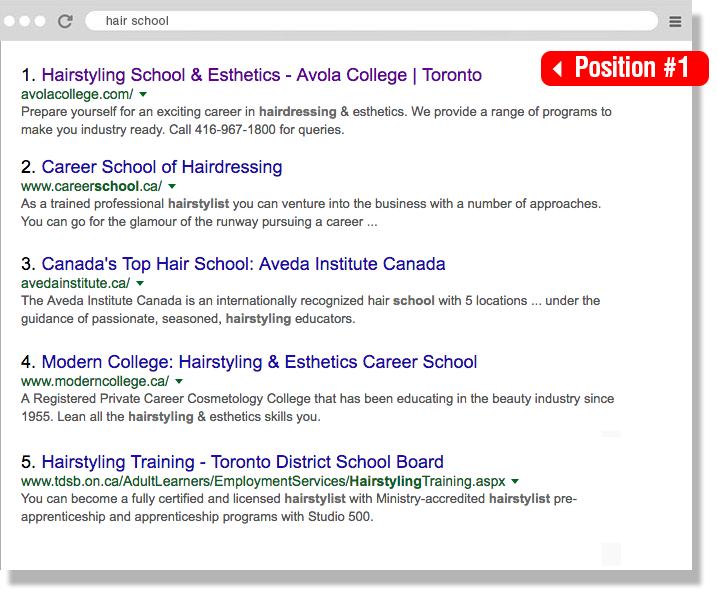 Being near the top of Google searches is a must for a business like Avola College - a school for Hairdressing and Esthetics. Being found on the first page of Google provides prestige and an immediate sense of trust in the company and their reputation. This is a competitive category and very challenging to rank high. Success was achieved for many keywords and the results continue to bring in new leads regularly. There are lots of home builders and contractors out there so naturally the competition to be found on page 1 of Google is fierce. The key for to success for ranking Valleymede Homes was to focus on their specialty which is luxury homes. They only build large custom homes so that narrows down the competition but was and is still challenging. With persistence we achieved every high rankings for several focused keywords like "luxury home builder", "custom home builder". Since that's exactly what they do, it works. There is no shortage of renovation and building contractors in a large city and they all need a steady stream of new business to survive. HomeRenoCare is a directory for all kinds of home services and ranking well for many keywords is important for their business. We started working on the website SEO when the domain was brand new so it had no authority and no rankings at all. After 6 months the site is began to rank well for many long-tail keywords and extremely well for some primary keywords in the Local Map results. 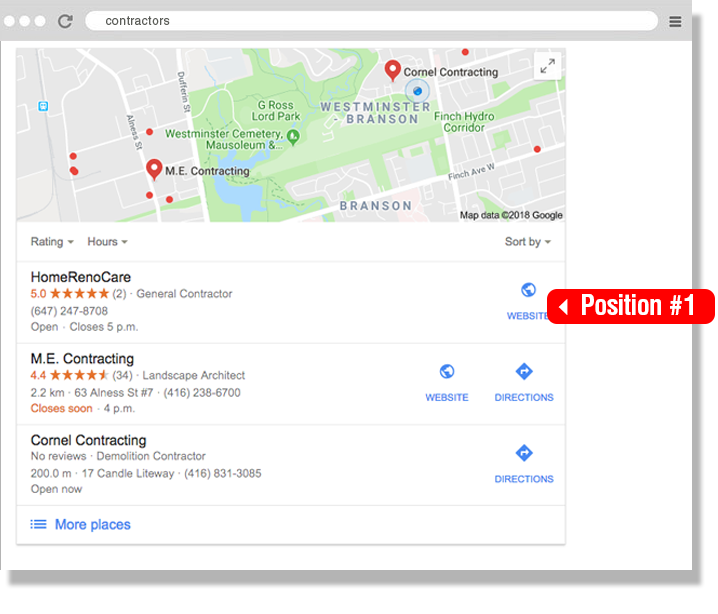 As shown, in the screenshot here, it ranks #1 in a local search for "contractors" which is highly competitive, gets about 6,600 searches per month and delivers 297,000,000 results. Variation phrases like, General Contractors, Kitchen Contractors, Home Improvement Contractors, Renovation Contractors are also in first position in the map results. It's important to the company to have high visibility in Google searches so we complied a long list of related keywords and went to work optimizing the site for those keywords and finding backlinks etc. We compiled a long list of keyword phrases and there were hundreds. The most searched keywords were highly competitive. This project falls into the category of "Local SEO" since people need to find home service provider that come to their home. This project presents several challenges because it needs to rank for many keywords, compete with large sites like Houzz, Yelp, Yellow Pages, HomeStars and it's not limited to just one city, they need to rank across the country. 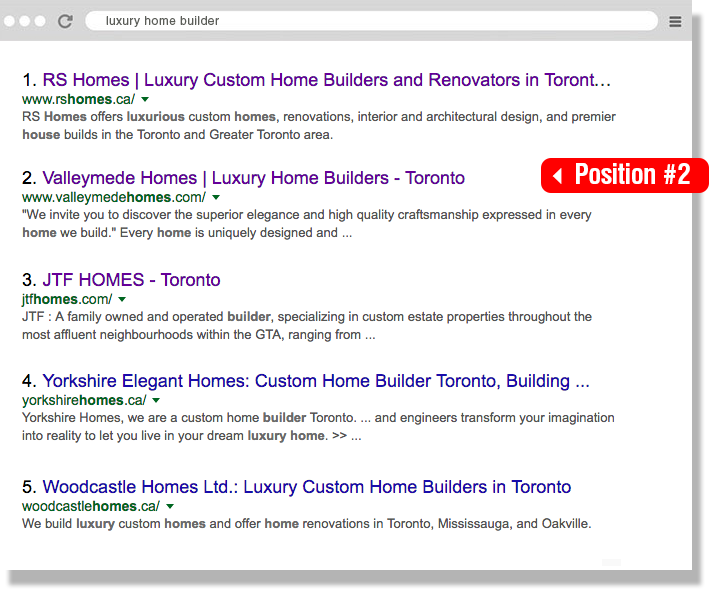 As you can see in the screenshot, HomeStars, Houzz and the Ontario General Contractors Association take up the first 3 SERPs. The goal of course is to rank high in the organic results and we did so with what we call "easy wins" (less competitive or long-tail keywords) at first. Then it get a little easier to move up the high value keywords.